It takes a village to raise a child, the old proverb holds. In the case of a robotic toddler called iCub, the plan is for the international community of roboticists to work together to let this robo-tyke unlock the future of humanoid robotics.t takes a village to raise a child, the old proverb holds. 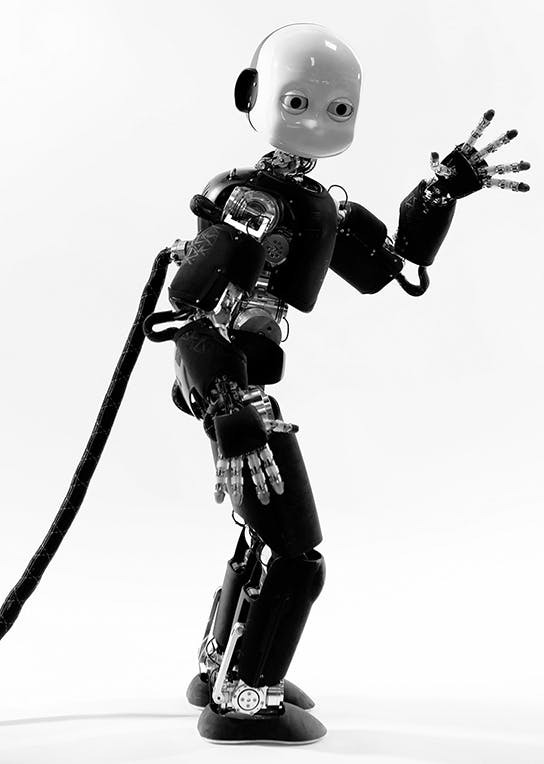 In the case of a robotic toddler called iCub, the plan is for the international community of roboticists to work together to let this robo-tyke unlock the future of humanoid robotics. It’s a future that Giorgio Metta, a researcher at the Italian Institute of Technology and one of the creators of iCub, says he’s optimistic is on its way. But there’s a challenge: Most robotics work requires researchers to make new robots from scratch, making it costly and time-consuming to build on previous researcher. As they detail in an article published Wednesday in Science Robotics, Metta and his colleagues explain that their open-source robotic toddler is designed to solve that problem, as teams across the globe work with 36 identical copies of iCub. This robotic kid can crawl on all fours, sit up, walk, grab things, and is one of the few robots in the world with a sensitive “skin” coating its entire body. All of these features allow scientists to see how they can improve upon this already pretty high-tech A.I. However, it’s the open source aspect of this project that is the biggest deal for researchers. Before this, teams of engineers would build their projects from the ground up. All the hardware and software that would make up their robot would be created in-house and the final product would be displayed and described in a paper. Testing things in a lab environment requires scientists to recreate the exact conditions described in a previous paper. While this might be doable for other fields, recreating an entire robot from scratch would take months of work and if a slight coding detail is left out the documentation there would be no way to accurately test prior work. iCub addresses of these problems. There are 36 exact replicas of the 3.4-foot-tall machine, giving scientists across the globe the ability to improve upon a baseline subject and then come together to see how their work functions when it’s put together. The robot uses middleware — essentially software that glues different types of software together. This way code for iCub can be written on various platforms without issue. Metta sees this as a way to bridge together research that hundreds of scientists have spent years on to create some real-world robots to help out with everyday activities. And what might those first humanoid robots to reach the market be like?